When I was researching and writing my dissertation, I would fantasize about some magic technology that would transcribe my speech into text, complete with Chicago-style formatting, and I could dictate my research notes and chapter drafts while swinging in a hammock and sipping umbrella drinks. If this sounds somewhat quaint, I should note that I wrote every last one of those 440 pages on a first-generation iMac (BLUEBERRY!) 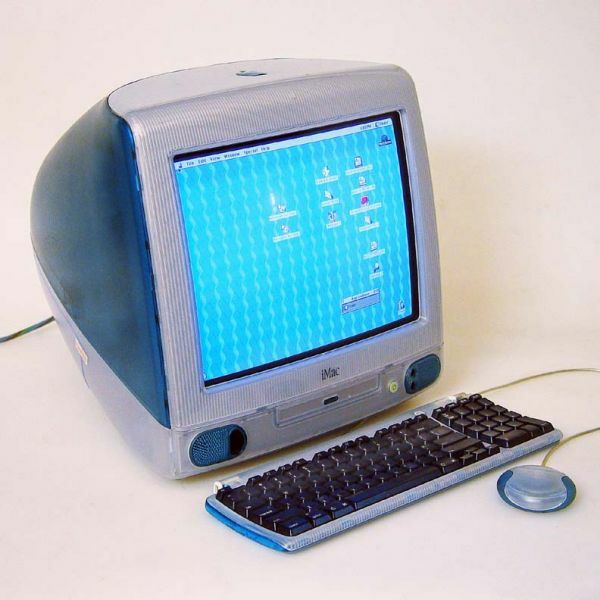 using WordPerfect 8 for Macintosh, and taking breaks on AOL dial-up internet. So speech-to-text really seemed like a pipe dream, given that every time one of my cats jostled the loose phone jack, I’d get booted offline. Fast-forward fifteen years, and I recently found myself in the same sort of techno-fantasy land. Because I am batshit crazy embracing scholarly productivity, I’m currently working on an article and two book manuscripts. And while the research process for the three contains some overlap, it’s not a whole lot; I’ve learned that I need to really up my organization game if I want to manage these projects. Like many academics, I’ve embraced Evernote as a digital tool that offers me the best framework for taking, organizing, and archiving my research notes. Whether I’m looking at primary or secondary sources, I can create separate notebooks for each source, or corresponding to a particular chapter in the manuscript(s). Within the notebooks, by utilizing a good tagging system (developed through trial and error, and full of idiosyncrasies), I can even search for particular sources and phrases. With the premium version of Evernote ($5.99/month), you can even search the text of PDFs or any OCR-enabled format as well. I collect PDFs of articles, and use a cam-scanner app on my mobile devices that saves to PDF, so this feature is a GAME-CHANGER. There are a number of ways Evernote can be harnessed as an uber-tool for research; Raul Pacheco-Vega has generously shared his resources on Evernote for Academics (also described here), and he is a total Evernote Ninja. I also found Catherine Pope’s Managing Your Research With Evernote for Windows very helpful (don’t worry, Apple hipsters users, there’s one for Mac, too). You can tap the mic to pause and resume speaking. Quote this is a direct quotation quote. I’ve learned that the speech-to-text is very literal. It will “type” a number if you say it (like it did for “22” in this example), but if I want to denote a range, I have to say it like so: “twenty one dash twenty two.” If you say “comma” or “period” or “parentheses,” it will insert those symbols by default. If you want an ellipses, just say “period period period.” It will not, however, do so for quotation marks, so as you can see above, I denote direct quotations by saying the word “quote” at both the beginning and end of the quoted passage. 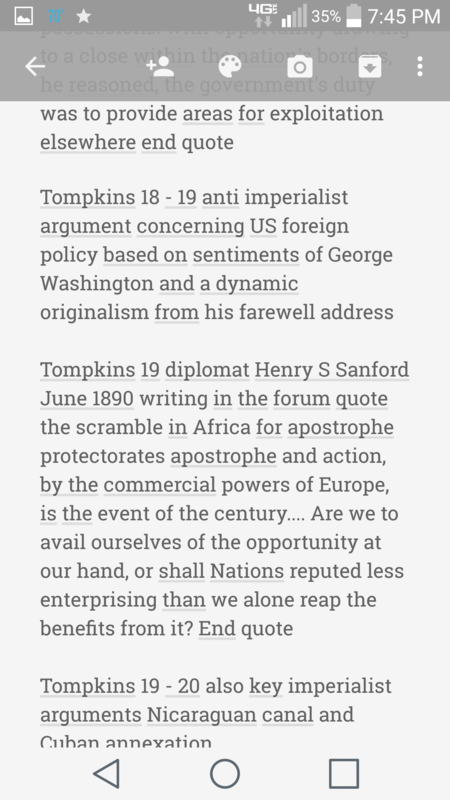 (And by saying “apostrophe” to set off quotes-within-quotes). Oh, the meta of it all. 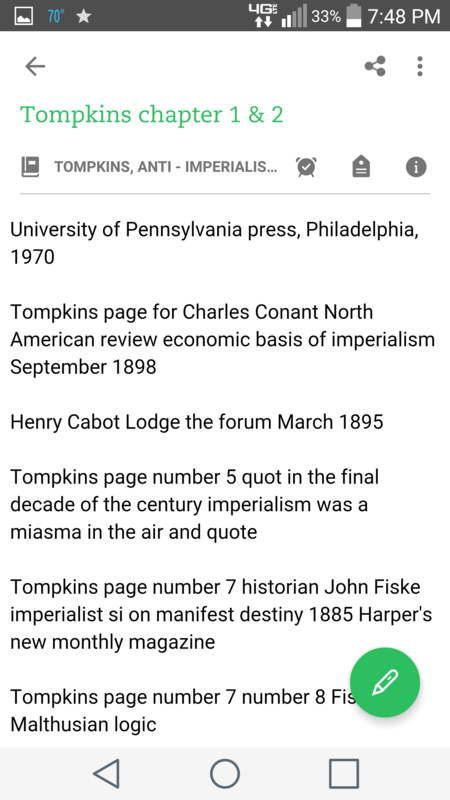 Once I’ve recorded my notes (and I usually go by one note document per chapter when I’m using a secondary source), I then use Keep’s settings menu to share the note. Lots of places to share, including Evernote. Then, the note shoots over to my default notebook in Evernote, where I can then move it to wherever it is going to reside on a more permanent basis. Note on the screenshot below that I’ve named the notebook with the monograph’s title, and this note here (since it’s the first one in the notebook) has the citation information right up top. Then I tag the note with the appropriate terms, in order to quickly reference the things I need once I start drafting the chapter. BOOM. Done. No writing, just speaking. YAY. I also scan through the notes and clean up any mis-transcriptions as I go. Then I go back over them at the end of my reading/dictating session to both review what I’ve done and make sure everything’s in its place and tagged correctly. I also keep a separate notebook of bibliographic information for every source I use. Zotero is also an excellent way to wrangle your sources–especially if you’re engaged in bigger projects like I am. However, it doesn’t have a mobile version, and the handful of third-party apps haven’t impressed me. So I house all of that in Evernote (and copy it to Dropbox, too, since I’m Type-A when it comes to bibliographies. My preciousssss). So that’s the process–just read, talk, rinse, repeat. 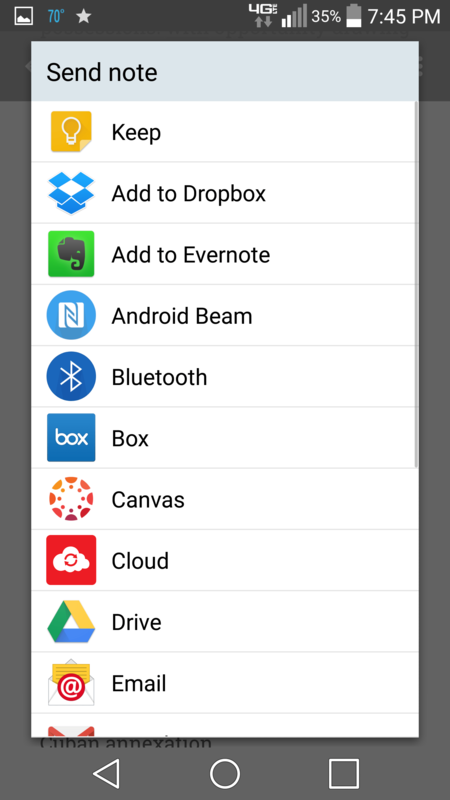 Evernote has a bunch of space available via a free account, but I’ve found that I use it enough, and upload enough notes and other documents (scans, etc.) that it’s worth getting the premium version, especially when it enables offline storage of notebooks and such wide-ranging search capabilities within all of my notes. It’s also worth noting that this tends to use a fair amount of battery, at least on my device, so if you’re going to do some heavy-duty reading and transcription sessions, have a battery pack or charger handy. Also, this is all Android-based–but there’s an iOS version of Google Keep, so you hipsters people who pay for too many apps Apple users should be able to replicate this process fairly easily. This has been a really useful method for me to both speed up the reading and note-taking process, as well as manage my research notes much better across my various projects. I’m fortunate in that I read fairly rapidly, and speaking instead of writing allows my notetaking to keep up more closely with my reading speed. And anything that helps me keep my various endeavors straight, and thus eliminates a significant potential stressor, is worth its weight in gold. If you decide to try this hack, trust the process and let it work for you–it takes a little bit of getting used to and time to develop your rhythm, but it’s worth the investment. Happy researching! I am using the Swype + Dragon Dictation keyboard for speech to text. Therefore I don’t need to share Keep with Evernote. The speech transcription of Swype + Dragon Dictation is richer: Even the commands “New Line” and “New Paragraph” are at your service. As I am Dutch, I use the Dutch/English combination, which works excellent. Hi Kevin! I appreciate you sharing these tips. I found your blog post while searching for some voice to text options & you’ve been so helpful. Thank you! I downloaded Keep app & have been trying it out. The only problem I’m having & can’t seem to find a solution to yet is that the microphone turns off quickly, before I can finish my voice notes. It turns off as soon as I pause to take a breath…did this ever happen to you? I’ve tried to find settings to change – read the Keep app info – nothing so far…so, back to my voice recorder on my phone for now. I’m glad you found this helpful! I haven’t encountered the mic-turning-off issue with Google Keep… I wonder if it’s a device settings issue? Maybe check your input settings and see if there’s some sort of default length of time for the mic to collect text. I tend to go a couple sentences at a time, turn off the mic for a pause, then a sentence or two again. That may be the way to avoid the mic timing out. Thanks for the information you shared in this post. I’m a novice blogger, grad student, and full time trucker and I struggle with finding the time for proper writing and research methodologies. I have found a work-around that allows many of my texts to convert into audio so I can listen as I drive but note taking just isn’t feasible sitting on a 40 ton bullet. I have tried several speech to text apps but have been disappointed with the limitations. I was pleasantly surprised with the results after implementing your solution. The best part is that it integrates with my bluetooth headset and makes the whole process hands free. Now I have 14 hours of semi-productive (pun intended!) time instead of just windshield time each day. Thanks again! Never made it past the second paragraph. Yet you persevered and made it all the way down here! Good work–I knew you could do it if you tried! Good article — I am currently seeking a way to do voice-to-text AND record an audio version for me (or my virtual assistant) to be able to check the text against later, since voice-to-text still has a long way to go in actually capturing fluently spoken speech. Unfortunately this seems like it’s still an untouched frontier in the tech world, which baffles me, because I know I can’t be the only person whose thoughts come better when speaking than typing. 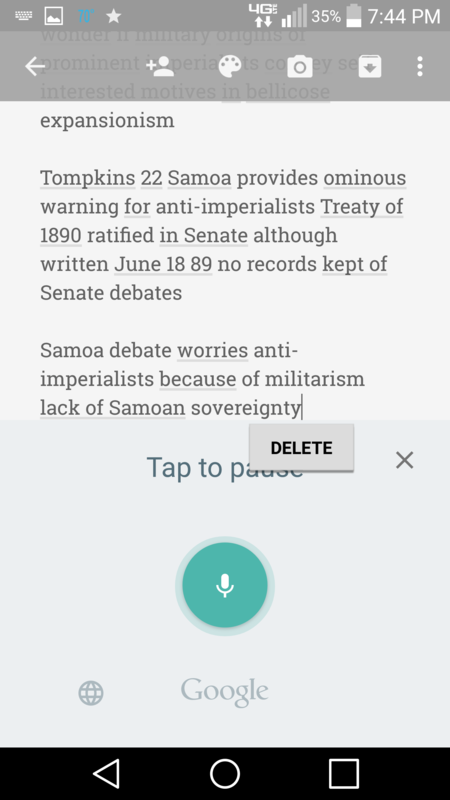 Nowadays the Evernote Android app is allowing voice-to-text in text notes when you press the microphone button on the keypad. But even though the app will let you TYPE when recording an audio note, it won’t let you use the voice-to-text feature because it says “Can’t reach Google at the moment.” Google seems to disallow voice to text when you’re recording audio. Frustrating to see that with all our capabilities in 2016, we can’t accomplish this well. A bit silly that we have to choose either voice-to-text (which can be wildly inaccurate at times and which doesn’t seem to be able to keep up with my speed of talking–even Google’s is not very good at actually capturing an entire paragraph of text) OR audio recording (which then must be transcribed by hand or submitted to a service that you have to wait for). Still looking for another way… Let me know if you find any! Thanks for sharing. What are the drawbacks of Google Keep that prevents you from just using Keep, instead of starting in Keep and then going to Evernote? Don’t get me wrong; I love using Evernote. Just curious about Keep’s capabilities/limitations for what you’re doing. Great post. Thank you for taking the time to help the rest of us. Previous Previous post: I Come to Bury Disruption, Not to Praise It.